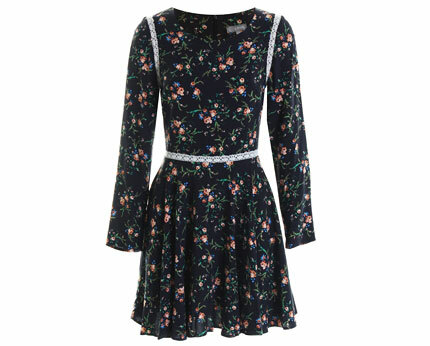 This Love Macie print folky Tee dress is a charming little vintage inspired dress perfect for your winter wardrobes, its stylish, classic and super cute and girly. If you’re a fan of this vintage trend then this is an absolute must have item for you. The design is incredibly stylish featuring a delicate floral print with a pretty lace trim around the shoulders and waist which cinches in beautifully and accentuates to the max! The longer length sleeve is a charming feature which enables this dress to be practical for the cooler months. Team this pretty little number with tights and flat shoes, pop on leather and you have a perfect boho sassy style that will be the envy of all others. Rock it up with wedged shoe boots and a cropped jacket and transform your day look to evening glam! This dress in incredibly easy to wear and the design and shape will flatter all figures! This dress features v shaped neckline and wrap over pleats in the front. Defined waist with ties. Lined. Made of 100% Polyester.